Top up securely using your credit/debit card or PayPal. We receive your payment then text you your Call2Abroad calling PIN. This is a French landline number, so if you have free calls to landlines this should be a free call. At the prompt, enter the full international number to call (including the 00 & international dialing code). Do not press the call button again. 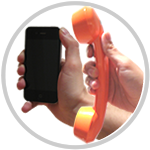 Use Call2Abroad to call anywhere in the world quickly, easily and cheaply from your French mobile or landline. Make international calls from your UK mobile from 1p/min. Purchase Call2Abroad credit instantly online then make your call by dialing our access number followed by your full international number. You save on calls to anywhere in the world, such as calls to USA and Europe from 1p/min, calls to India for 1.5p/min, calls to Australia and China from 1p/min. Make savings of up to 90% compared to dialling direct with your regular landline or mobile provider. You can use your Call2Abroad credit directly from the mobile you topped up or from any other phone using a PIN. It's so easy to use and our rates are unbeatable!